Worlds Chat was the very first three-dimensional avatar world to become widely available on the net, starting in April 1995. My design for the Worlds Chat client included the textures used in the 3D environment, each of which had to be compressed down into a square and run through a custom 8-bit palette. It was brutal. 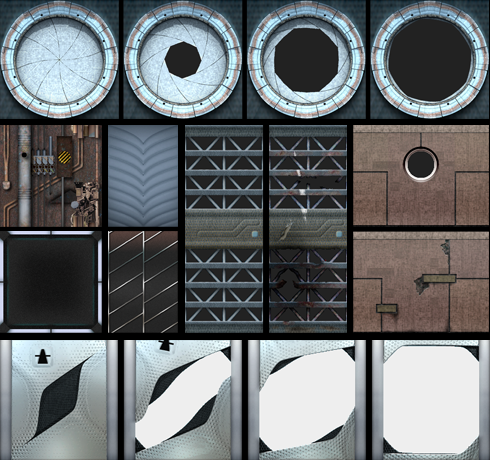 Several textures were animated, such as doorways that activated on approach. I modeled the airlock (top row) in 3d after testing several constructs out of cut pieces of paper. Design and architectural inspiration came from my interest in sci-fi, as well as from wide ranging sources like the buildings of architect Shin Takamatsu. Copyright © 1995-2019 scamper.com. All rights reserved.